When Srivas Pandit saw extraordinary manifestation of the Lord, he was overcome with feelings of love and began to recite hymns of praise. Mahāprabhu was pleased with Srivas Pandit’s recital and told him to call his wife and family members to see His divine form. He gave His prasad to Narayani Devi and showed His mercy to her by making her utter the Holy Name. Just as the devotee is dear to the Lord, the Lord is also dear to His devotee. Narada Muni in Kṛṣṇa’s lila has become Srivas Pandit in Gaura lila. Narada Muni’s friend Parvata Muni appeared as Srivas Pandit’s younger brother Sri Rama Pandit. Srivas Pandit’s wife Malini Devi is Ambika, Kṛṣṇa’s wet nurse in Vraja. I pay obeisances to the Supreme Lord Sri Kṛṣṇa who has appeared in five aspects: as a devotee, as the expansion of a devotee, as the avatāra of a devotee, as a pure devotee and as the devotional energy. The supremely potent is revealed in five different manifestations according to His desire to experience five different pastimes. Ontologically there is no difference between them: they are one truth expressed according to five dispositions. Thus Śrī Gauranga, Śrī Nityananda Prabhu, Śrī Advaita Acharya, Śrī Gadadhar Pandit and Srivas Pandit and the other devotees, are ontologically non-different from one another. Nevertheless, that one truth is manifest as a devotee (bhakta-rūpa), the expansion of a devotee (bhakta-svarūpa), the avatāra of a devotee (bhaktāvatāra), the energy of a devotee (bhakta-śakti) and the pure devotee (bhaktākhya), according to the desire to relish different tastes of divine relationship. Of these five truths, the Supreme Lord Himself, the son of Nanda, takes on the devotional mood to become bhakta-rūpa. His full expansion (svayaṁ prakāśa), Balaram, takes on the devotional mood and appears as the bhakta-svarūpa, Nityananda Prabhu. 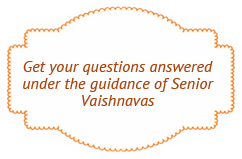 Maha Viṣṇu takes on the devotional mood and appears as the bhaktāvatāra, Advaita Acharya. These three are all Prabhus, i.e., they are Viṣṇu-tattva. The devotional energy (bhakta-śakti) and the pure devotee (śuddha-bhakta) are classified as energies of Viṣṇu-tattva, which are considered non-different because of their dependent relationship. The principal devotional energies are Gadadhar Pandit, Svarupa Damodar Gosvami, and Ramananda Raya. The pure devotees include Srivas Pandit and others who are in the moods of friendship or servitude. Srivas Pandit is thus a member of the Pancha Tattva. Srivas Pandit hailed from Sylhet. He later came to live in Nabadvīpa where he became instrumental in enhancing the Gauranga lila. From the Chaitanya Bhagavata and Chaitanya Chritāmṛta we learn that Srivas and his three brothers, Srirāma Pandit, Sripati Pandit and Srikanta or Srinidhi Pandit were all participants in Mahāprabhu’s lila. Gauḍīya Vaiṣṇava Abhidhāna cites Prema-vilāsa in saying that Srivas Pandit’s father was a Vedic Brahmin of the name Śrī Jaladhara Pandit. Srivas Pandit was the second of five sons. The eldest son named Śrī Nalina Pandit had a daughter named Narayani Devi, mother of the author of the Chaitanya Bhagavata, Vrindavan Das. Narayani Devi’s husband Vaikuntha Das Vipra died while she was pregnant with Vrindavan Das, so she left her husband’s house in Kumarahatta (Halisahar) and came to live with Srivas Pandit in Nabadvīpa. Mahāprabhu felt great joy upon hearing such words from the mouth of His own devotee and answered, “You are a devotee. By your mercy I will surely have devotion for Kṛṣṇa some day.” Even though they could not help but be attracted to Nimai, the devotees were unable to recognize Him as their own worshipable Lord due to the influence of His Yogamaya līlā-śakti. This is a most astonishing and attractive pastime. When Mahāprabhu instituted the loud chanting of the Holy Names in His own house and in that of Srivas Pandit, all the atheistic neighbors began to complain that they were losing sleep because of the noise. They looked for ways to counter the movement and even started false rumors that the king would come soon to punish the devotees. The naive Srivas Pandit believed these stories and was filled with anxiety. He began to worship Nṛsiṁha Deva for protection. Understanding that Srivas Pandit was afraid, the Lord, who takes away the distress of His devotees, went to His house. He kicked open the door and said, “Who are you worshiping? Who are you meditating on? Behold! He whom you are worshiping is standing before you! I will save the righteous and destroy the wicked. You should worry no longer!” So saying, He sat down in the heroic posture (vīrāsana) and revealed the divine form of Lord Nṛsiṁha, holding the conch, discus, club and lotus. When Srivas Pandit saw this extraordinary manifestation of the Lord, he was overcome with feelings of love and began to recite hymns of praise. Mahāprabhu was pleased with Srivas Pandit’s recital and told him to call his wife and family members to see His divine form. He gave His prasad to Narayani Devi and showed His mercy to her by making her utter the Holy Name. Just as the devotee is dear to the Lord, the Lord is also dear to His devotee. Kṛṣṇa dressed as a dancing performer, ornamented with a peacock feather on His topknot, karṇikāra flowers on His ears, wearing a yellow garment as brilliant as gold, and a Vaijayantī garland around His neck. He entered the forest of Vṛndāvana, the pleasure garden of His auspiciously marked feet, while filling the holes of His flute with the nectar of His lips. The cowherd boys began to sing His glories. As soon as Nityananda Prabhu heard the verse, He fainted and the eight ecstatic symptoms appeared on His body. Vishvambhar clasped Nityananda Prabhu to His bosom. A few days later, Mahāprabhu indicated that He wished Nityananda Prabhu to perform the Vyasa Puja ceremony, so preparations were made for this ritual to be held at Srivas Pandit’s house. On the eve of the ceremony, when the adhivāsa kirtan was being sung, Mahāprabhu Himself was possessed by the spirit of Baladeva, thus revealing Nityananda Prabhu’s identity with Balaram. Then He called out Advaita Acharya’s name “Nāṛā, Nāṛā!” (“one who makes something move”) revealing how Advaita Acharya had made Him descend by His prayers. On the following day, Srivas Pandit, took the role of the ceremony’s acharya. After completing the puja, he placed a flower garland in Nityananda Prabhu’s hand and told him to offer it to Vyasadeva while chanting the appropriate mantras. Nityananda Prabhu, however, put the garland around Mahāprabhu’s neck. Mahāprabhu immediately gave Nityananda Prabhu a vision of a six-armed form. At the end of the Vyasa Puja, Mahāprabhu ordered the devotees sing the Holy Names. Later He asked Srivas Pandit for the prasad of Vyasadeva which He personally distributed to all the devotees, as well as to Srivas Pandit’s servants. Everyone ate the offerings with great pleasure. When Mahāprabhu saw Srivas Pandit’s devotion to Nityananda Prabhu, He blessed him saying that there would never be any poverty in his house and that even the dogs and cats in his house will have a steady devotion to the Lord. When Mahāprabhu desired to begin His sankirtan pastimes, He held them in the house of Srivas Pandit with only His intimate associates present. When the kirtan began on an Ekadasi, Mahāprabhu revealed many transformations of estatic love as soon as the chanting began. The scriptural injunction is that one should engage in Harikirtan on Ekadasi, also known as Hari-vāsara. On that night, Mahāprabhu, the life of the world, began to dance. This auspicious beginning for the sankirtan movement took place in the pious Srivasa Pandit’s courtyard, where the sound of Kṛṣṇa’s names Gopal and Govinda rose to the sky. Mahāprabhu ordered that the doors should remain closed, and the wicked and hard-hearted persons who were refused entry began to criticize Mahāprabhu and His devotees. Mahāprabhu’s followers ignored their insults and continued to ecstatically sing the Holy Names. Just as the long night of the rāsa-līlā seemed to the gopis to last only a few moments, the nights of kirtan at Srivas Pandit’s house seemed brief to Mahāprabhu and His followers. At the end of one such night, Mahāprabhu placed all the Śālagrāma-śilās on His lap and sat down on the altar where He revealed His divine nature in a wonderful form and accepted all the food offerings given to Him by His devotees. On another occasion, Mahāprabhu exhibited Mahā-prakāśa-līlā, “the pastime of the great epiphany” at Srivas Angan. This is recounted in chapter nine of Chaitanya Bhagavata’s Madhya-khanda. On that occasion, He withdrew His devotional mood, stopped all His divine trances, and openly revealed His divinity, sitting on Viṣṇu’s throne for twenty-one hours. At His signal, the devotees performed the abhishek ceremony reserved for the king of kings according to the scriptural regulations. The devotees made their offerings of flowers and gifts and Mahāprabhu stretched out His feet and accepted them without artifice. He then gave all present a blessing, fulfilling their personal desires. In the course of this twenty-one-hour Mahā-prakāśa-līlā, Mahāprabhu appeared in the forms of all the previous avatars. One evening, Srivas’s mother-in-law hid in a corner of the courtyard from where she hoped to be able to see the Lord’s sankirtan pastimes. Being the indweller of all beings, the Lord was aware of her presence and kept repeating to His companions that on that day He felt no joy in the singing of the Holy Name. This was very disquieting to the devotees who, suspecting that some outsider might be hiding there, started to search through the house. When Srivas Pandit found his mother-in-law, he was mortified and taking her by the hair, led her out of the courtyard. Only those who have received the mercy of Śrī Chaitanya Mahāprabhu have the right to witness His pastimes. On another occasion, a certain brahmachari who subsisted on milk alone asked Srivas Pandit for permission to see Mahāprabhu’s kirtan. Srivas Pandit knew that he was sāttvika in his habits and so he invited him in. Srivas Pandit had the brahmachari hide inside the house, but Mahāprabhu, the indweller of all beings, was well aware of what was taking place. He said, “I don’t know what is wrong with the kirtan today, I am feeling no pleasure in it. I think that there must be an outsider here somewhere.” Srivas Pandit became afraid and said, “A brahmachari who takes only milk asked if he could watch You dance. He was so eager and I knew him to be austere so I let him in.” Mahāprabhu became angry and answered, “One cannot attain devotion to Kṛṣṇa without surrendering to Him, and certainly not by drinking a milk diet and engaging in other superficial austerities. Make him leave.” The Brahmin fearfully left the house, but still asked if he could have a partial look at the Lord. The most merciful Lord called him to His side and placed His lotus feet on his head, telling him not to make a show of his austere practices out of pride. When Mahāprabhu put on a play about His Vrindavan pastimes at Chandrasekhar’s house in Mayapur, Srivas Pandit played the part of Narada Muni. Advaita Acharya took on the role of the clown, or vidūṣaka and Hari Das Ṭhākura played the police officer. Mahāprabhu Himself first played Rukmiṇī and then the Ādyā śakti, while Nityananda Prabhu played the part of an old woman. The Lord again sat on the altar in the mood of the goddess of fortune, Lakshmi Devi. As the mother of the universe and in a spirit of affection for His devotees, He fed them breast milk. Mahāprabhu’s kirtans went on at Srivas Pandit’s house with the doors locked every night for a full year. During this time, many non-devotee Brahmins tried to make fun of Mahāprabhu and His associates. Several of these non-devotees became envious because they were unable to see what was going on and insulted the devotees. One of them was a Bhattacharya Brahmin named Gopal Chapala who decided to destroy Srivas Pandit’s reputation by placing a plate of offerings intended for Kali on his doorstep. These included liquor and meat, red hibiscus (jabā phūl) flowers, red sandalwood. In the morning, when Srivas Pandit opened the door, he saw these items and started to laugh. He loudly proclaimed, “Look everyone! I am a Shakta. I have been worshiping the Goddess all night long.” His better-behaved neighbors were pained to see what had taken place and they removed the offending items and purified the doorstep with cow dung. When Mahāprabhu had taken sannyas, He came once to Kuliyā, the site where offences are forgiven. Kuliya is the present-day town of Nabadvīpa, also known as Koladwipa. This time, when Gopal Chapala begged Him again to be forgiven, Mahāprabhu was compassionate and told him to ask forgiveness of Srivas Pandit. One has to ask forgiveness of the very devotee one has offended if one wishes to be freed of the offence. When Srivas forgave Gopal Chapala, he was liberated from the effects of his offence. The unfortunate Devananda Pandit, though a great lecturer in the Srimad Bhagavatam, was devoid of devotion. One day, Srivas Pandit went to listen to him lecture and being a great devotee, was deeply affected by the Bhagavata’s verses and tears started flow from his eyes in midst of the assembly. Devananda Pandit’s students, who were all pashandis, forcibly dragged Srivas Pandit outside for disturbing the audience. Even though he saw his students acting in this way, Devananda Pandit did nothing to stop them. Thus, he too became an offender to a Vaiṣṇava. Mahāprabhu later roundly rebuked Devananda Pandit for his inaction on this occasion. Later on, Devananda Pandit had the good fortune to come into the association of Vakresvara Pandit who taught him Chaitanya Mahāprabhu’s true identity. He thus became sorry for the offence he had committed and received Mahāprabhu’s mercy. According to Gaura-ganoddesa-dipika, Devananda is Nanda Mahārāja’s court pandit, Bhaguri Muni, in Vraja lila. In the mood of amānī mānada, – one who does not ask for any respect for himslef but always respect others, Mahaprabhu would embrace everyone and with a great urge beg them to chant the names of the Lord. These followers would then engage in the loud chanting of the Holy Names in the accompaniment of mridanga and conch shells. Materialistic persons considered them to be nothing other than musicians and dancers who were worshiping Mahamaya on the wrong day and would insult them with various blasphemous statements. One day the local magistrate or Kazi, known as Sirajuddin Chand Kazi, was walking by and saw the scene. Hearing the loud noise of the kirtan he became irritated and angry. He went to Srivas Pandit’s house and broke the mridanga and had some of the devotees beaten as a warning. He said, “If anyone does this sankirtan again, he will be punished even more severely.” This brought great satisfaction to all the non-devotees of the town, and they joyfully continued to mock the devotees. When Mahāprabhu received word of the incident, He became very angry. He ordered the devotees to take torches and musical instruments and to join Him fearlessly for sankirtan. He divided the devotees into several groups and then led the procession along the banks of the Ganges, Himself dancing at its lead. Thousands of men, women and children put aside their housework to join Him and follow the sankirtan procession. When the miscreants heard the sound of the kirtan, their hearts began to tremble. Meanwhile, when Chand Kazi heard that thousands of Hindus were approaching his house, he ran inside to hide, trembling with fear. Chand Kazi then showed the scratch marks that had been imprinted on his chest by Nṛsiṁha Deva’s claws. He then promised that neither he nor anyone from his family would ever stop sankirtan again. He also became Mahāprabhu’s devotee. The tomb of Chand Kazi is in Brahman Pushkarini, the present-day Baman Pukur, by which stands a very old Goloka Champa tree. Both Hindus and Muslims offer their respects to the tomb of the Chand Kazi. After a night of kirtan at Srivas Pandit’s house, when Mahāprabhu returned to external awareness, He would go with all the devotees to bathe in the Ganges. Sometimes the devotees would ceremonially bathe the Lord at Srivas Angan. One of Srivas Pandit’s servant girls named Dukhi would watch Mahāprabhu’s ecstatic dancing with tears in her eyes. She also performed the service of filling jugs of water from the Ganges for Mahāprabhu’s morning bath. Mahāprabhu observed her devotion and was pleased; He changed her name from Dukhi (unhappy) to Sukhi (happy). One day, Srivas Pandit’s only son died as kirtan was being performed in his house. Srivas Pandit was afraid that the sounds of mourning from the women’s quarters would disturb Mahāprabhu while He was engaged in singing the Holy Names. So he swiftly went inside the house and tried to quiet the women by explaining spiritual truths to them. When they still didn’t stop their loud lamentations, Srivas Pandit threatened to throw himself into the river and drown if they did not stop making noise. This had the desired result. Mahāprabhu said, “How could I ever abandon devotees who love Me to this extent!” and started to shed tears. After Mahāprabhu had taken sannyas and was living in Puri, Srivas Pandit would come with the other devotees each year to stay with Him for the four months of the rainy season. Advaita, Nityananda Prabhu, Mukunda Datta, Srivas Pandit, Vidyanidhi, Vasudeva Datta, Murari Gupta and all of Mahāprabhu’s other devoted servants met with Him in Puri every year and stayed four months. Mahāprabhu engaged in various pastimes in their company. Srivas Pandit was a participant with Mahāprabhu in His pastimes of cleaning the Gundicha temple and Rathayatra. He was the principal singer in the second kirtan group or sampradaya, whose chief dancer was Nityananda Prabhu Himself. Sri Svarupa Damodar was the lead singer and Advaita Acharya the dancer in the first kirtan group; in the third, Mukunda Datta was the principal singer, while Hari Das Ṭhākura danced. Govinda Ghosh the lead singer in the fourth, with Vakresvara Pandit dancing. The fifth sampradaya came from the village of Kulina, and Ramananda Raya and Satyaraja were its principal dancers. 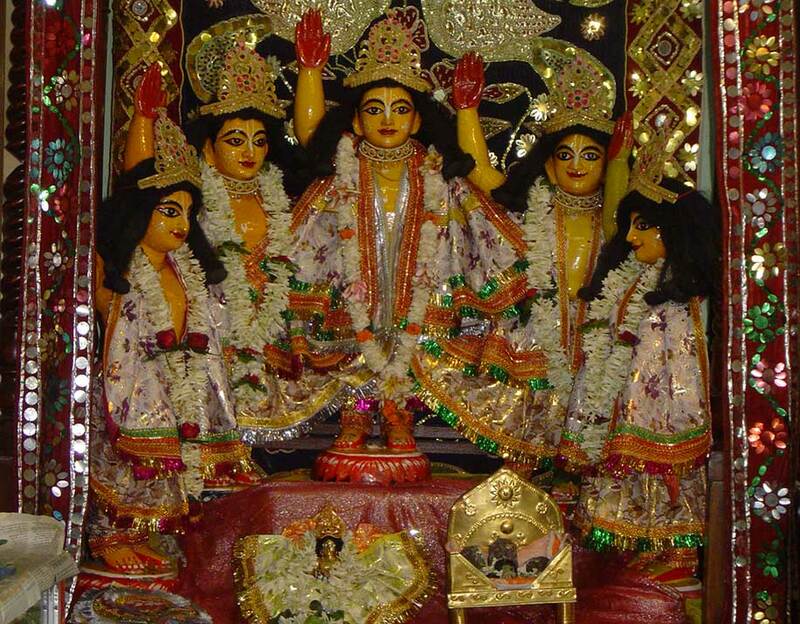 The sixth group was from Shantipur in which Achyutananda danced. The seventh group was composed of the residents of Srikhanda, of whom Narahari and Raghunandan took the lead roles. When Mahāprabhu wished to dance, all the seven groups came together. On one such occasion, the king Prataparudra was watching Mahāprabhu’s energetic dancing while leaning on his servant Harichandan’s shoulder. In the meantime, Srivas Pandit came and stood in front of Harichandan to watch Mahāprabhu dance. The king’s servant kept pushing the deeply absorbed Srivas Pandit, telling him to move so that the king could see. Srivas Pandit became irritated at the repeated disturbance and finally turned around and slapped Harichandan. Harichandan became angry and was about to hit him back when the king stopped him, telling him how fortunate he was, to have been touched by the hand of a devotee such as Srivas Pandit. One day, Srivas Pandit and the other devotees led by Advaita Prabhu were joyfully glorifying Mahāprabhu’s name, form, qualities and activities in Puri. Mahāprabhu became angry and left the scene, but later accepted defeat and acquiesced to their desire to glorify Him. After Mahāprabhu took sannyas in Katwa, Srivas Pandit found it impossible to remain in Nabadvīpa where everything was full of painful reminders of the lord. He and his brothers moved to Kumarahatta (Halisahar), the birthplace of Ishvara Puri. Even so Srivas Pandit and his brothers made annual trips from Kumarahatta to Nilachala to see Mahāprabhu and to Mayapur to visit Sachi Mata. On one occasion Mahāprabhu came to His guru’s birthplace and showed His respects by taking some dust and wrapping it in His cloth. Since then tourists to that place took the dust from there with great veneration. Consequently, a puddle (doba) was created which is famous as Chaitanya Doba. Srivas Pandit’s appearance day is the eighth day of the waning moon (kṛṣṇa astami) in the month of Chaitra, and his disappearance day is celebrated on the tenth day of the waning moon (kṛṣṇa dasami) in Asharh.